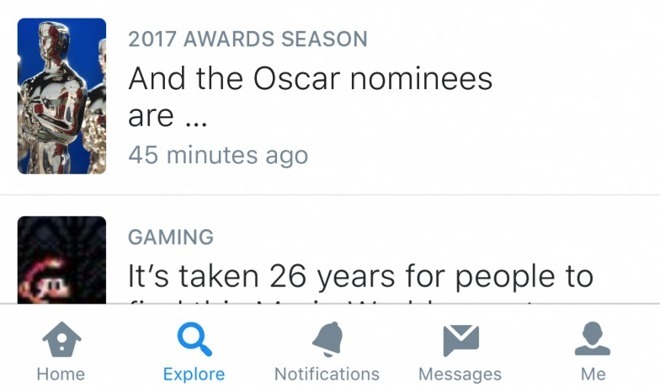 Completing a test phase, Twitter on Thursday announced the widescale debut of a new "Explore" tab for iPhone and iPad users, grouping together several features including a relocated Moments interface. The new tab highlights ongoing live video, as well as trending hashtags and topics. It also includes a search bar, and pushes Moments —aggregated posts connected to a single news topic —into a "Today's Moments" category. In fact Explore replaces a formerly dedicated Moments tab. Explore appears to be rolling out gradually on iOS. For Android device owners, it's only expected to deploy "in the coming weeks." Testing of the feature began several months ago, with the earliest reports of the feature seen in October. While still a popular service, Twitter has struggled to achieve real growth, especially versus its rivals Facebook and Snapchat. The company has been adopting a variety of tactics in response, such as lifting some character limits, and integrating live video. Indeed the company has been broadcasting live content from some high-profile sources, including the MLB, NBA, NFL, and Bloomberg. On the Apple TV, users can even tune into video and watch tweets filter in at the same time.